The relationship between an instrumental performance and its setting is a symbiotic one: room acoustics, the location, number and types of instruments, the placement of the listeners, and so forth will affect—sometimes decisively—the way that the sound is produced, received and decoded. 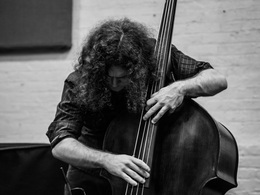 Norwegian double bassist Michael Francis Duch’s solo performance in Oslo’s Tomba Emmanuelle, recorded on 13 May 2013 with his Czech-Ease bass, shows how deeply an acoustically distinctive space can affect the sound, and even the architecture, of an unamplified performance organized around minimal harmonic movement. In a sense any live performance is site specific, being shaped by the contingent factors that determine the acoustic response of its setting. What sets this performance apart from many is the fairly extreme nature of the venue. The Tomba Emmanuelle is a large, barrel-vaulted space renowned for its echoing acoustics. Originally built as a museum for the work of artist Emanuel Vigeland, it became his mausoleum and, after being opened to the public, has been used regularly for concerts. Duch’s performance, a single 28-minute long piece, makes full use of the mausoleum’s peculiar acoustics. 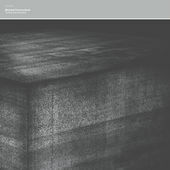 At the beginning Duch settles into an apparently simple, steadily and evenly bowed drone grounded in the bass’s low G. Aided by the accumulating echo, the drone turns out to be rather complex. About five minutes into the performance the G seems to ramify as the lower partials become audible; an A emerges as well, possibly the effect of the adjacent A string beginning to vibrate in sympathy with the bowed E string. The sonority ramifies further into a chiming, bell-like chord, which itself multiplies into something sounding like a harmonic cycle played on a carillon. After a brief fade Duch resumes the drone an octave higher—presumably on the open G string—and over time brings in a variety of techniques to alter the timbre: flautando effects through changes of bow and/or finger pressure; bowing on the bridge for a brittle, glassy sound; playing microtonal near-unisons to produce a sound like the throbbing of unsynchronized airplane engines as well as a phasing effect. As the performance develops Duch gradually introduces more tonal and harmonic variety against the drone, and ends with rapidly played harmonics alone. With fundamental pitch held more or less constant throughout, the listener’s attention can turn to the microstructures of the music—the local changes in texture and dynamics that the room’s acoustics help to bring forward and that cumulatively shape the performance’s macrostructure. Although the resonance of the space tends to pile up sounds and make for a thick texture, within the thickness there is some variation, particularly when the lower tones drop out about 19 minutes in. Duch’s manipulation of attack and accent through changes in bowstrokes also exploit the ambient echo to momentarily increase and then lessen the density of the sound, in addition to introducing nuanced variation of dynamics. A fine recording of a mesmerizing performance, best heard through headphones. On December 18, 19 and 20th, the Max Johnson Trio will be in residence at Ibeam with special guests joining us every night. The trio of Kirk Knuffke (cornet), Max Johnson (bass) & Ziv Ravitz (drums), will be playing two sets at 8:30 and 10:00pm with guests joining for the 2nd set. On the 18th the trio is joined by Ben Goldberg (clarinet), on the 19th, Steve Swell (trombone), and on the 20th, John O’Gallagher (alto saxophone) and Ingrid Laubrock (tenor saxophone). The trio will be debuting a set of brand new music that they will be recording for their 3rd album, to be released next year on Fresh Sounds records. In addition, they will be playing new music written the expanded group with guests. Party Knüllers: Was Something Lost in Translation? Meredith Monk, the composer, vocalist, director and choreographer whose multidisciplinary works have influenced a couple of generations of American artists, is being celebrated this season for 50 years of creativity in New York. On Friday night, the day after she turned 72, the essential American Composers Orchestra opened its 38th season with a program at Zankel Hall titled “Monk’s Sphere,” conducted by the ensemble’s music director, George Manahan, the first of its two Orchestra Underground concerts in that popular subbasement performance space at Carnegie Hall.